Instant Knockout Review: Will it Really Help You Reach Goals in the Gym? Bottom Line: Instant Knockout is an all-natural formula made with quality ingredients, but it may not be the right choice for everyone. 2. History of the Brand: How Did Instant Knockout Start? 6. Who’s Instant Knockout For? 7. How Does Instant Knockout Work? 8. Does Instant Knockout Work? 13. Any Instant Knockout Lawsuits? 16. Would Instant Knockout Work with Your Diet? 17. Verdict: Would I Recommend Instant Knockout? I’m always on the lookout for new fat burners to try. I know eating right and exercising is the way to a healthy body, but I like to see if these supplements can speed the process, or if they are just hype. Most of them are really just hype, but I still keep trying different ones. Instant Knockout is a fat burner that was targeted at MMA fighters. My review includes a bit of my personal experience, along with research to support the ingredients, other user reviews, and more. If you’d like to try it for yourself, Instant Knockout can be purchased through Amazon or using their Official Site. The product is a fat burner made for athletes to drop weight quickly and safely. According to the company, MMA fighters use it to cut weight when they need to. The supplement can keep the appetite at bay and boost metabolism. It’s produced by Roar Ambition, a supplement company based in London, England. In a press release dated October 2015, the company reported success in their first year with Instant Knockout and TestoFuel in the U.S. market. Green coffee beans are high in chlorogenic acid, which is thought to burn fat. It appears the supplement is manufactured in London. Instant Knockout is for anyone who wants to lose weight and build muscle. There is another formula, Instant Knockout Women that’s designed for women to use. It provides the body with several ingredients designed to boost the metabolism – caffeine, green tea, cayenne pepper, and green coffee bean. It also provides the body with vitamins, and glucomannan – an appetite suppressant. Yes, when taken at the four times per day dose, you are getting clinically proven doses of many of the ingredients. That said, you may not be able to take that much every day because of side effects. You’ll get the best results if you take Instant Knockout with a balanced diet and regular exercise. It’s not a magic pill, and won’t magically melt the pounds away without a little work on your part. If that was the case, we’d never have to buy anything else! You can expect to have more energy and less of an appetite throughout the day. You can use other supplements with it, so long as they don’t contain caffeine or other stimulants. Too many stimulants can make you sick and wreak havoc on your body. There’s nothing to worry about here since you just take the pill and swallow it up to four times a day. Instant Knockout can cause insomnia. Though the formula is all natural, that doesn’t mean it’s free of side effects. I experienced some insomnia because I took a dose too close to bedtime. I also saw reports of irritability, anxiety, headaches, and even drowsiness. Do not use for more than a couple of months. Don’t take it late at night, or with other supplements containing stimulants. Do not take if you are pregnant, nursing, or under the age of 18. If you are taking prescriptions to treat any medical condition, speak to a doctor before beginning this supplement. At this time, there does not appear to be any lawsuit against Instant Knockout or the company that makes it. “It’s an energy pill that you can feel but if you’re looking for the Instant Knockout from bodybuilding magazines and sites this isn’t it. Those are from a company called “Roar Ambition”, this company is called “Nutra4health”. A little intentionally deceptive marketing got me. This is the supplement facts for Instant Knockout. This should work with any diet as it does not contain any gelatin, according to the supplement facts label above. The only thing that may be an issue is the artificial colors. Honestly, I had a good experience with it, and I liked that I was able to see the amount of each ingredient in the formula. I would recommend it as long as you are not too sensitive to caffeine. You will have to give up your morning cup of coffee if you take this! There are a lot of promo codes available, like this one for 25 percent off, so you can at least save a bit of money if you decide to try it. 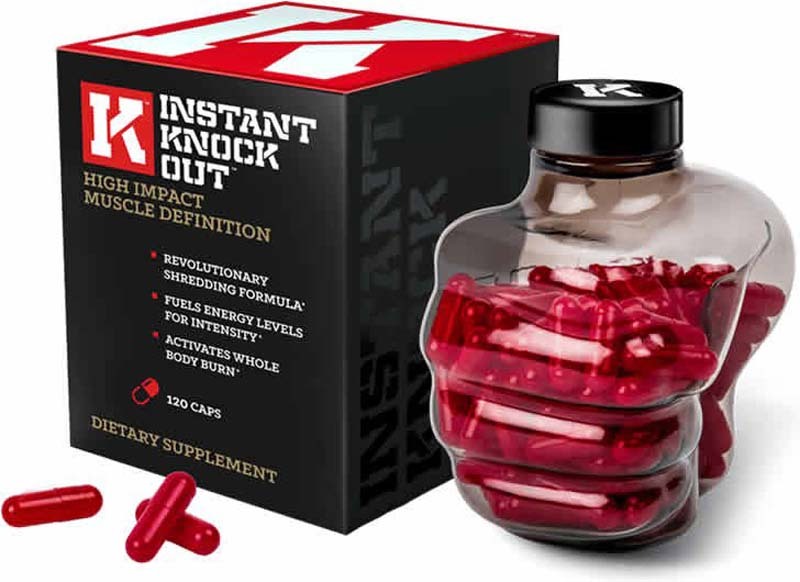 Instant Knockout can be purchased through Amazon or using their Official Site.